The problem of honey fungus. As regular readers will have noted, the Accent team is always on the lookout for garden pests, weeds and baddies of all types and is committed to finding ways of warning our friends and thwarting them at every turn if possible (the pests not our friends). Well, cutting them back at any rate, or slowing them down, in some cases just casually dissuading them, but the point stands. In the case of Honey Fungus we have tried our best to find a remedy and there really is only one thing that destroys it – fire. 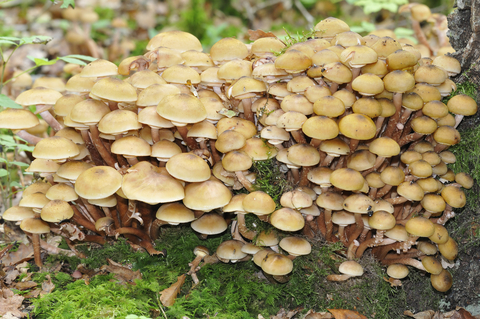 Honey fungus is the common names for several species of fungi that attacks and kills the roots of the host plant. In doing so, the root system and lower part of the tree is fundamentally damaged and eventually can become unstable and liable to fail. Yes, with almost every weed or garden pest there are ways of controlling the spread & effect and often there are treatments for infected plants. Unfortunately the various varieties of honey fungus are so tenacious and resilient that it cannot be cured by anything save a violent approach that harms the host as much as it harms the fungus. This may seem like a fairly dire assessment already, but wait, it gets worse. Honey Fungus is so aggressive and so good at what it does that it often infects entire beds and established trees. A single source won’t spread more than 30 metres in diameter but it does reproduce making the area of infection almost limitless. Everything that is sensitive to it within that area is considered a good host. It is in fact so good at spreading that a single strain of fungus was found in Oregon that had colonised 880 hectares of land, making it the largest living organism on Earth! Admittedly it took about 2,300 years to grow to that size, but in the process this single fungus destroyed a forest. Not only does this mean that the honey fungus is virtually immortal, but it has actually insinuated itself into human history as far back as the writings of Aristotle who made note of it for its ability to glow in the dark. It is even mentioned as a hazard in documents from the first and second world wars due to concentrated patches of the fungus glowing and drawing fire from guns and bombers. Needless to say, this is scary stuff. It often lives in old rotting tree stumps and spreads from them to near by healthy trees and shrubs. The toadstools also release spores from their gills and these find their way into freshly cut surfaces of pruned trees and new stumps, relentlessly spreading throughout an area. So, how to tackle it? The first step is of course to identify the plants that have been contaminated with the fungus. This is a fairly easy step as the infected plants will have woody stems and will be looking very ill indeed. Closer inspection may reveal white mycelial growths on the surface or inside the plant stems if you take cuttings. Only around June to September will you see the characteristic fan shaped mushrooms appear. If you discover this on a plant then the next step must be quick action. Once the plant has been infected there is no way to save it, so it must be dug up, along with the entire root system and as much of the surrounding soil as possible since this is where the fungus hides, which you will be able to tell by the black, bootlace like rhizomorphs tangled about the roots. Once dug up the plant must be burned, not composted, burned and the ashes disposed of carefully. Even now it isn’t over, as plants surrounding the infected one should also be dug up to make sure the fungus hasn’t spread. You can “quarantine” these in pots, but if they show any signs of infection they must be burned as well. Once the area is cleared you must tackle the soil. This can be done with a simple barrier; cordon off the affected area and place a 45cm deep ring of pond lining or plastic sheeting to block the rhizomorphs. Once this is done, regular cultivating of the soil will break up the rhizomorphs and removed and destroyed eventually killing the fungus, but even then the patch of soil should be left for a year before anything is planted in it. Being realists, after the year, we suggest replacing the plant stock with varieties that have a resistance to attack. These plants include varieties of woody stemmed shrubs such as Cercis; Chaenomeles; Eleagnus; Pittisporum & Pieris. More resistant trees include Ash; Beech; Catalpa; Yew & Liquidamber. In the South East of England it is common and some experts suggest that every garden with lots of trees has some honey fungus present. We wouldn’t be quite that negative. It still is nasty stuff and the garden owner should be diligent to avoid the problem.